With donations from Women of Vision Giving Club members, each new mom receives a diaper bag and sleep sack after delivering her baby at Riverview Health. For some, leaving the hospital with a new baby can be overwhelming. Will your baby be safe? Is his or her car seat properly installed? Do you have all the supplies you need at home? The members of Riverview Health Foundation Women of Vision Giving Club want to help ease the transition. 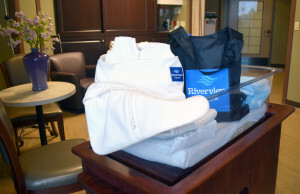 With gifts from the club, each mom leaves Riverview Health Maternity Center with a diaper bag and a sleep sack to swaddle her baby in. The Women of Vision Giving Club is a group of empowered women who are dedicated to making a difference. The philanthropic focus of the club is addressing the growing healthcare needs of women and girls who come through the doors of Riverview Health. Members of the club have two options when deciding to join—either a $250 associate membership or a $500 voting membership. All year, club members work to raise money for Riverview Health. At the beginning of each year, each department at Riverview Health receives a grant application, and in March, the voting members gather to decide which grants to fund. Not only does each member receive benefits, such as a discount at Riverview Women’s Boutique and a free eight-week fitness class at Riverview Health Rehab & Fitness, but they can also feel confident that 100 percent of their membership dues benefits women’s services, programs and equipment at Riverview Health. Women of Vision Giving Club membership is open to any woman who feels strongly about supporting the health and wellness of the women in her community.